Another month, another Daniel Brooks show at Buddies. 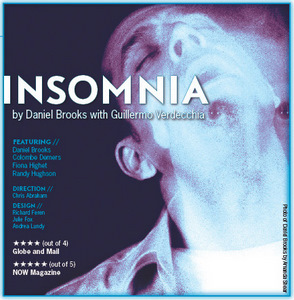 Technically, this remount of the Daniel Brooks/Guillermo Verdecchia-written show that last appeared in Toronto in 1998 is directed by Chris Abraham, but it has Brooks’ fingerprints all over it. And what that means is a masterful use of lighting and sound that is almost worth the price of admissions alone. Insomnia is a strange sort of show. The plot centres on John F., played by Brooks, an insomniac (surprise, surprise) who has to deal with the stress of a new baby, writer’s block, fights with his wife, jealousy of his brother’s success and a crush on his brother’s wife (who just happens to be narcoleptic). Thing is, John’s insomnia has put his mind into such a fevered state he can’t tell reality from fantasy – and as the audience, neither can we. If David Lynch did theatre, his plays would be something along the lines of Insomnia. Randy Hughson turns in a typically captivating performance as John’s brother William, and Colombe Demers is eerily compelling as his wife Kate. But this is a show where atmosphere and stagecraft are ultimately more memorable than individual performances. The space is radically transformed through the use of light, which can create hallways or keep characters in tiny boxes. As the narrative dissolves into fantasy, the play becomes willfully confusing – what is the meaning behind the bicycle? Or the full geisha outfit Fiona Highet wears while walking across the stage speaking Japanese? If you can put up with not really knowing what’s going on all of the time, it’s easy to be swept up by the play, particularly during Brooks’ intense and strangely magical physical vocabulary dance. Less successful is the political/moral diatribe delivered directly to the audience by his character, which probably could have been cut down somewhat. This is the kind of play where you have to relax and enjoy the ride and not worry if events on stage seem hard to explain. Even as the play seems crashing towards a gruesome and almost Shakespearean tragic ending, it sets up a beautifully-rendered final scene which, through no small amount of rug-pulling, provides at least some sort of explanation for what has transpired. This is one play unlikely to put you to sleep.